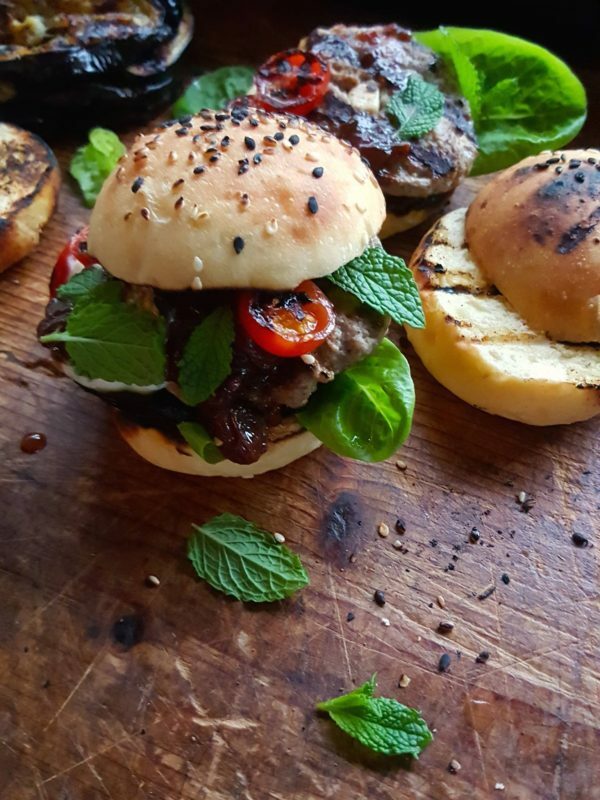 lamb eggplant burgers with spicy tomato chutney – best ever! Red wine and little nuggets of feta in the patty mix gives these patties plenty of flavour. 1 In a large bowl thoroughly mix mince, shallots, garlic, allspice, oregano, salt, pepper, coriander, lemon zest and red wine. Mix in 2 tablespoons of water, then stir in feta. Shape into 8 large or 16 half-size patties. Make the patties larger than the cut pide pieces or slider rolls because they will shrink during cooking. Stack patties on a plate, covering the layers with food wrap, then refrigerate. The patties can be made up to 8 hours ahead, but bring to room temperature before cooking. 2 Slice eggplant into thin rounds. Lightly brush slices on both sides with olive oil, or dunk briefly in oil, and cook on a preheated barbecue hot plate or in a ridged grill pan until golden on both sides. Transfer to a plate as the pieces are done and sprinkle over a little sea salt. 3 Mix yoghurt, garlic and mint together, cover and refrigerate until required (this can be mixed 2-3 hours before required; use it chilled). 4 Cook patties on a preheated oiled barbecue hot plate, or on an oiled grill over a gentle heat, or in an oiled non-stick frying pan until golden brown on both sides (be careful not to overcook them). Transfer to a plate. The pide can be lightly toasted, or served fresh. Cut each loaf in half through the middle (down the length), then into 8 pieces. 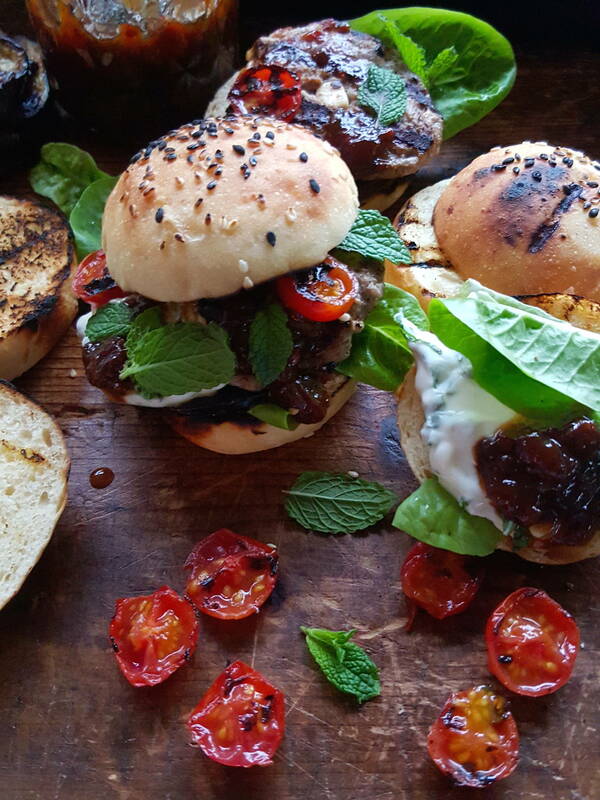 Spread pide or slider tops and bases with tomato chutney then top with patties and eggplant slices, drizzle with yoghurt dressing, add a few green leaves and two halves of tomatoes then put pide or slider tops in place. Serve immediately.